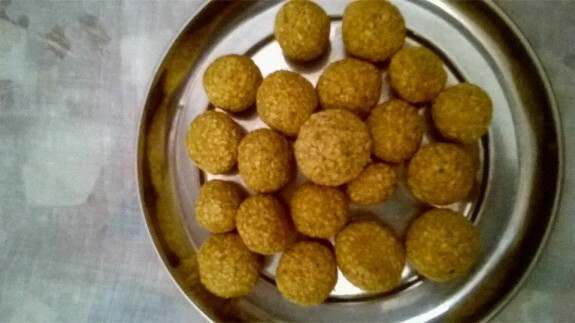 Tile r Naru or Til ki Laddu is a very traditional dessert for the people of Bengal and Maharastra. Find the step by step guide for this traditional til ki laddu recipe which you can make in any special ocassion like Laxmi Puja, Diwali, Makar Sankranti etc. 1. Clear and then roast the sesame seeds till they are light golden in colour. Keep it aside. 2. Add ¼ cup of water and jaggery in a pan. Stir it continuously in low heat until it gets sticky and sticks on the back of the ladle. Also, you can take water in a small bowl and pour a drop of gur into it. If it drops down on the end of the bowl, then your gur is ready. 3. Remove from the heat and keep it aside for few minutes to have it cool. 4. Pour the jiggery on the roasted sesame seeds and mix it properly. 5. Grease your palms with little ghee and take small portion from the mixture and roll it to give it a shape of ball. Your Til Ki Laddu or Til er Naru is ready.